Nuclear power plants generate more than half of the US’s low-carbon electricity. However, record low gas prices associated with the US fracking boom have made many existing nuclear plants uncompetitive in the current market. About 90 terawatt hours (TWh) of nuclear generation is scheduled to retire in the next decade, more than all of the US’s current solar generation. Studies suggest that another 135TWh is probably not cost competitive with gas plants and, therefore, at risk of retirement. This means the source of about 15% of US low-carbon electricity could shut down and largely be replaced by gas, making it harder for the US to meet its emission reduction targets. Research suggests that many existing nuclear plants would avoid being shut down if they were rewarded for their minimal CO2 emissions. Additionally, keeping existing nuclear plants open may be one of the lowest-cost forms of carbon mitigation, cheaper than building new wind or solar plants to replace them. If the US is going to retain most of its existing nuclear plants, “additional programmes to subsidise their life extension and continued operation will have to be implemented in just the next few years”, according to a recent study in the Proceedings of the National Academy of Sciences (PNAS). Nuclear power accounts for 20% of US electricity generation and more than half of the low-carbon electricity. In total, there are 60 nuclear plants currently operating in the US. While some carbon emissions are associated with nuclear plant construction and operation, on a per-TWh basis, nuclear generation has emissions equal to or below that of renewable energy technologies. Nuclear plants are expensive to build, but historically have been seen as having lower operating costs than most other sources of power once built. This is no longer the case in the US where a combination of an aging nuclear fleet, unprecedentedly low gas prices and increased low-cost renewables have put many existing nuclear plants at risk of premature retirement. Nuclear power plant in San Onofre, California, which is now shut down. Credit: Julius Fekete/Alamy Stock Photo. Five US nuclear plants have already retired over the past five years, despite regulatory approval to continue operation. Prior to their retirement these plants produced 38TWh of low-carbon electricity, or roughly half of current combined utility and small-scale US solar generation (77TWh in 2017). Nine US nuclear plants have announced that they plan to shut down over the next five years, representing an additional 90TWh. An additional 16 plants representing 135TWh are “at risk” of losing money compared to gas generation in the current market, according to a 2017 paper in the journal Energy by Michael Roth and Prof Paulina Jaramillo of Carnegie Mellon University. Overall, 263TWh of nuclear power has either been retired, has a planned retirement date, or is at risk of retirement due to market forces. This represents around 15% of all current low-carbon generation in the US. An additional six nuclear plants generating 67TWh of electricity were scheduled to be closed, but have been kept open by state-level policies in New York, Illinois and Connecticut. To examine why existing nuclear plants are becoming uncompetitive in the current market, Carbon Brief has compared estimates of their running costs with those for new nuclear plants and new or existing gas-fired generation. The figure below shows the estimated levelised cost of generating a megawatt-hour (MWh) of electricity from both new and existing nuclear and combined cycle gas plants in the US. Levelised costs per MWh generation for new and existing nuclear and gas plants. Initial capital costs are from EIA’s levelised cost analysis, ongoing capital cost estimates for nuclear are from NEI, operation, maintenance, and fuel costs are from the EIA. Chart by Carbon Brief using Highcharts. These numbers are based on fuel, operation and maintenance costs estimates for US nuclear plants from the US Department of Energy’s Energy Information Agency (EIA) and the industry-run Nuclear Energy Institute (NEI). The initial capital costs, taken from the EIA, assume that construction projects will be completed on-time without cost overruns, something that has generally not been the case for recently built reactors. Ongoing capital costs associated with the replacement and major renovation of old components have averaged around $7 per MWh in recent years for the aging US nuclear fleet, the NEI figures suggest, while similar ongoing capital costs for the much newer combined cycle gas plants have been negligible. Costs for current US nuclear reactors are split between fuel, maintenance, ongoing capital costs and operations, with operations being the largest single expense at $11 per MWh. These costs include payments to the government for nuclear waste storage and disposal. By contrast, fuel represents more than 80% of the costs for existing combined cycle gas plants – at $25 per MWh with current gas prices of $2.50 per MMBTU – with relatively small operations and maintenance costs of $3 per MWh each. Carbon Brief also analysed 30 financial reports from individual nuclear plants submitted to the Federal Energy Regulatory Commission (FERC) obtained through the Public Utility Data Liberation Project. These plants generally reported average operating expenses (excluding ongoing capital improvements) of between $19 and $61 per MWh between 2010 and 2016, with a median cost of $26 per MWh – the same as the average number found in the EIA data. One surprising finding is just how big a role employee salaries play in making nuclear less competitive than gas. A typical nuclear reactor with a capacity of 1,000megawatts (MW) will employ around 700 people, or 0.7 people per MW. Assuming a cost of around $100,000 per employee per year – including wages, taxes and benefits – Carbon Brief estimates that salaries add about $9 per MWh generated, higher than the cost of nuclear fuel. Other studies have suggested that salaries may comprise up to two-thirds of total operations and maintenance expenses, which would amount to $12 per MWh. A combined cycle gas plant with a capacity of 1,000MW would have only 30 employees, or 0.03 people per MW. This is 25 times fewer staff than is required by a nuclear plant, reflecting the relative simplicity and high level of automation found in new gas combined cycle plants. Lower labour and maintenance expenses represent one of the major cost advantages of gas over nuclear today and make up for the difference in fuel costs. Generating electricity from an existing nuclear plant is, typically, cheaper than building a new gas plant to replace it, the figures suggest. However, there are many existing gas plants that are not operating at full capacity, which could increase output to replace power from existing nuclear plants if they closed. Nuclear reactors in the US currently run about 90% of the time, while combined cycle gas plants only operate about 50% of the time. There is also a large amount of new gas capacity currently being installed in the US. There are around 400 new gas plants planned by 2020, representing 71GW of capacity. Roth and Jaramillo suggest that “the availability of such capacity would likely result in such plants making up for lost generation from retired nuclear power plants”. The recent PNAS paper by Prof M Granger Morgan and colleagues agrees, suggesting that “economic pressure from low gas prices”, rather than the expansion of renewable energy, is the primary driver of US nuclear retirements and will be the primary replacement for lost nuclear generation. The costs of nuclear shown here exclude one-time expenses associated with the decommissioning of reactors, which is estimated to be between 9-15% of the initial capital cost of a nuclear power plant. These decommissioning costs are already covered by a US Nuclear Regulatory Commission (NRC) fund that reactors have paid into over their lifetime and are reflected in reactor operating costs, so decommissioning retired reactors does not necessarily add any additional costs for utilities. Similarly, waste disposal costs were paid to the government by reactors as part operating costs, though are currently suspended until a permanent storage option becomes available. The NRC has determined that waste can be stored on-site for 60 years after a reactor shuts down. In their 2017 paper, Roth and Jaramillo built a model to estimate the cost of electricity generation at each US nuclear plant. They compared these to the cost of generation from gas to identify reactors at risk of being shut down due to market forces. 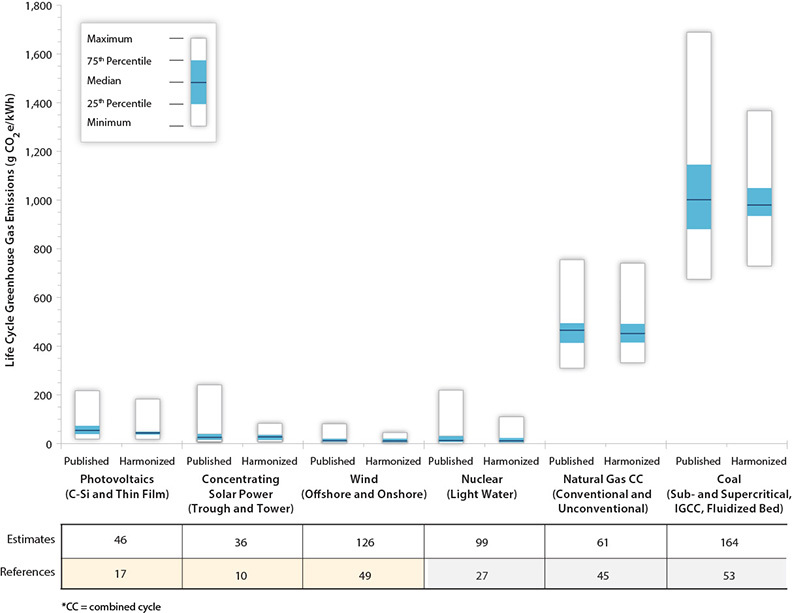 The figure below, adapted from their paper, shows these cost comparisons for each nuclear plant in the US – along with estimated uncertainties. Positive values in blue indicate that the plant is expected to be cheaper than gas between 2015 and 2040, while negative values in red show plants expected to cost more to operate than combined cycle gas turbines. Relative cost of electricity from each US nuclear plant between 2015 and 2040, compared to a combined cycle gas-fired generation plant. Based on “missing money payment” calculations in Roth and Jaramillo 2017. Note that the x-axis shows every other label name; hover over the bars to see each plant name. Chart by Carbon Brief using Highcharts. Roth and Jaramillo find a sharp divide in the economics of nuclear plants based on the number of reactors on site. Plants with a single reactor have a higher estimated cost of generation. However, all cost more than comparable gas generation. With the exception of the Cook plant, all multi-reactor nuclear plants are expected to remain cost-competitive with gas in the years up to 2040, at least in the EIA’s reference gas price scenario. Roth and Jaramillo’s findings are similar to an analysis done by the US Environmental Protection Agency (EPA), which determined that “some nuclear plants may be running at a deficit of $6 per MWh” compared to gas. These levelised costs present a somewhat incomplete picture of the economics of individual nuclear plants. Some of the multi-reactor plants that Roth and Jaramillo find are economically viable are, none the less, scheduled to be retired. This is because average electricity sales are not the full picture of plant revenue. Plants also make some revenue from capacity markets, where they are compensated for ensuring that sufficient generation capacity is available in the future. Capacity markets are volatile and generally do not comprise a large percentage of plant revenues. However, in a number of recent cases nuclear plants were not chosen in the capacity auction, with the bulk of the required capacity being provided by gas. Gas is also proving more viable in areas where lots of variable renewables have been installed. In parts of the Midwest US, large amounts of wind generation coupled with low demand often leads to near-zero or negative electricity prices overnight. Because fuel represents upwards of 80% of the cost of generation for gas, these plants can easily cut back production in times when prices are low and there is a surplus of renewable generation on the grid, as well as quickly ramping up production when prices increase. Nuclear, on the other hand, has low fuel costs and much higher fixed costs, such as salaries and maintenance. These mostly have to be paid, regardless of how much electricity is generated by the plant. While it is technically possible for nuclear plants to curtail generation, it is not particularly economic in most cases. The two most recent nuclear projects in the US illustrate this point. The construction of two AP1000 reactors at the Virgil plant in South Carolina was abandoned last year after massive cost overruns and $9bn in expenditures, contributing to the bankruptcy of Toshiba subsidiary Westinghouse – with knock-on impacts for nuclear projects around the world. The construction of another two AP1000 reactors at the Vogtle plant in Georgia is still ongoing, but the company expects the project to cost at least $25bn, more than $10bn over budget. Duke Energy recently cancelled plans to build new nuclear plants in South Carolina and Florida. New conventional nuclear plants are currently a very expensive means of producing low-carbon electricity, according to the EIA – even if they can be built on-budget. However, keeping existing nuclear plants operating – and not being replaced by gas – is a very different story. Roth and Jaramillo estimate that keeping the most uneconomic existing nuclear plant open would cost $69 per tonne of “CO2 saved” compared to gas. The typical at-risk plant would cost just $31 per tonne CO2 to keep open. They suggest that subsidising existing nuclear plants would be a cheaper way to cut CO2 emissions than building new wind, solar or nuclear plants. They argue that even wind generation, which has the lowest cost of avoided CO2 emissions, is more expensive than preserving the least financially viable nuclear plant currently in operation. That said, there may be individual plants where replacement with other low-carbon alternatives might prove more cost-competitive. For example, Pacific Gas and Electric – a large California utility – has argued that the replacement of the Diablo Canyon nuclear plant by renewables and storage would “have a lower overall cost than relicensing [Diablo] and operating it through 2044″. Others contest these claims, however, as they depend in large part on how quickly future renewable energy and storage costs decline. Roth and Jaramillo also suggest that the retirement of existing nuclear power plants will result in large amounts of low-carbon electricity being replaced primarily with generation from gas power plants, limiting the US’s ability to meet its emission reduction goals. They suggest that states could follow the lead of New York, Illinois and New Jersey by providing incentives to compensate nuclear plants for the value of their low-carbon generation similar to existing renewable energy credits, as this would provide a relatively cost-effective mitigation option. A recent report by the Rhodium Group projected that US emissions will continue to decrease up to 2020. Emissions may begin increasing again after 2025, with nuclear retirements playing an important role in driving the increase. The report’s projection – along with uncertainties – is shown below. Historical and projected US GHG emissions (in millions of metric tonnes of CO2e, MMtCO2e) from the Rhodium Group Taking Stock 2018 report (Figure 3). Uncertainties due to policy choices (dark blue) and land use emissions (LULUCF – light blue) are shown. The report suggests that the US nuclear fleet may shrink by between 13% and 26% by 2025, helping reverse a trend of declining US emissions driven by the retirement of coal plants, among other factors. There are many reasons why experts are sceptical about the future of nuclear power, particularly the economics of new nuclear power plants. However, the potential loss of around 15% of all low-carbon generation is problematic, when very rapid emission reductions are needed to meet US Paris Agreement targets. Nuclear | October 10. 2018.